Chapter one - Beautiful Quilts! Last week Mr Daisy and I packed our bags and stepped out into the big wide world. We literally caught trains, a plane and an automobile before being deposited in front of this building that looks like a giant crazy patch quilt. 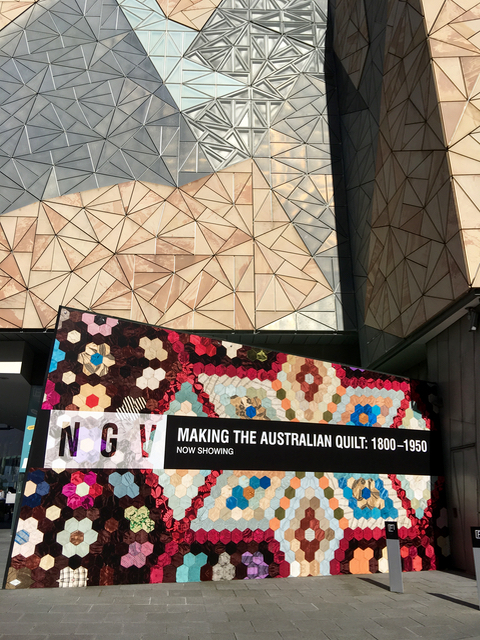 We were at the Ian Potter Gallery, National Gallery of Victoria in Melbourne to see the Making The Australian Quilt 1800 - 1950. An exhibition curated by Annette Gero and Katie Sommerville. I loved every stitch of this amazing exhibition! 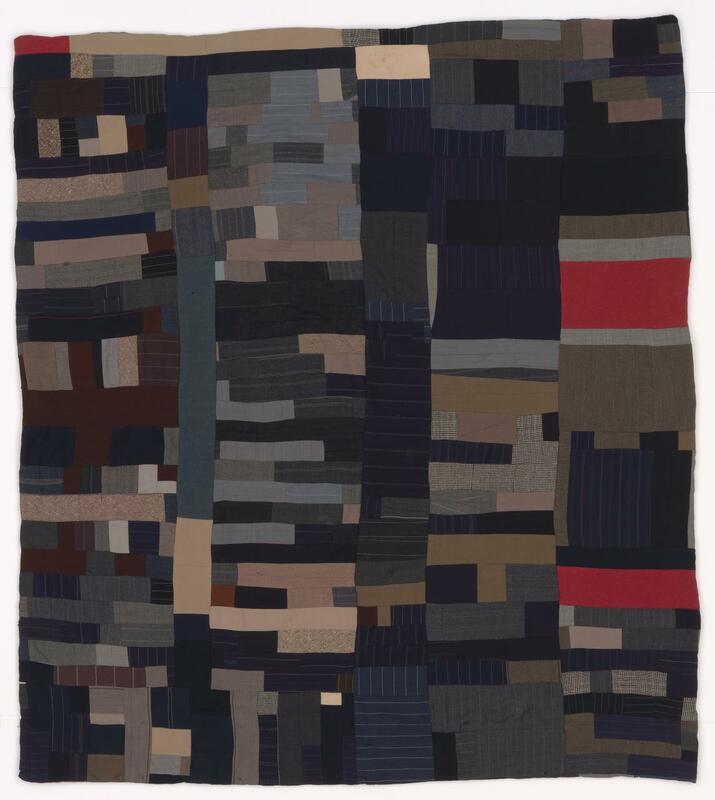 Australia doesn't have quilt museums so we rarely get to see these beautiful old quilts in real life. 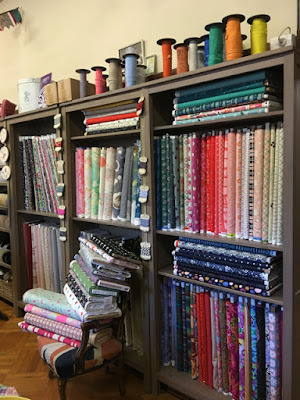 To see the maker's hand through their stitches, fabrics from other eras and different styles of quilts and patterns was a treat from the very first quilt till the last. It's early days for the show so I don't want to spoil it for those going to the show by showing lots of quilt photos. I really enjoyed the way the exhibition unfolded as we wandered through the different rooms. Each room had a theme and you never quite knew what wonders lay around each corner. 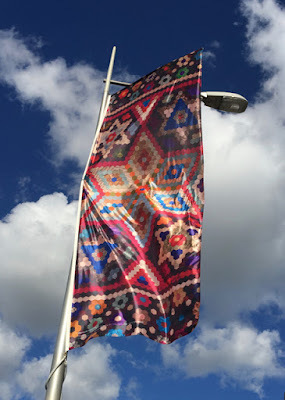 But it's nice to share a few quilt photos (shown with permission from Annette Gero).. The Rajah Quilt. 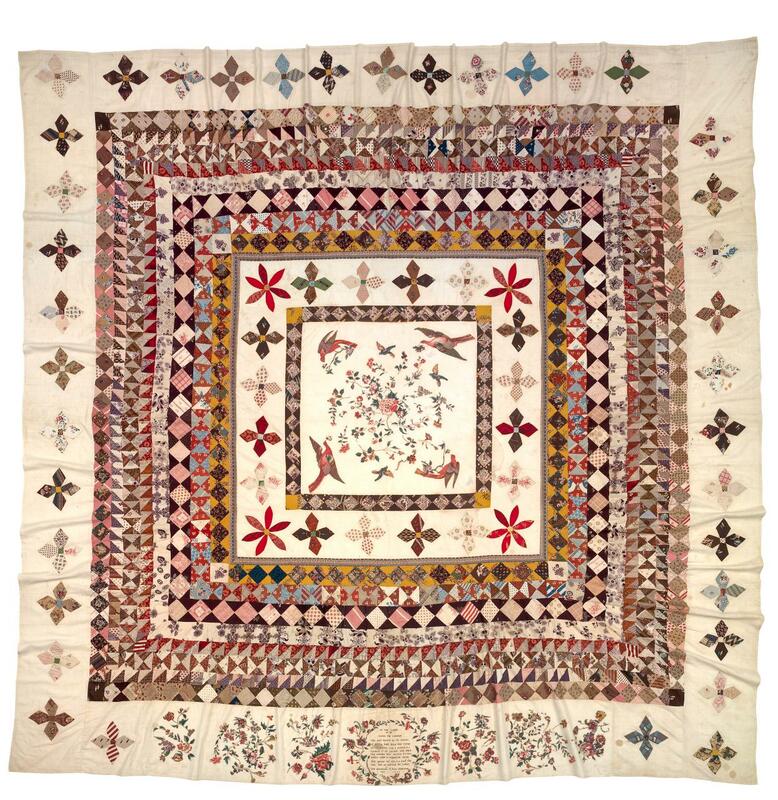 This would be one of Australia's most famous and special historical quilts. It was made by a group of convict women in 1841 on their way to Australia aboard the HMS Rajah. 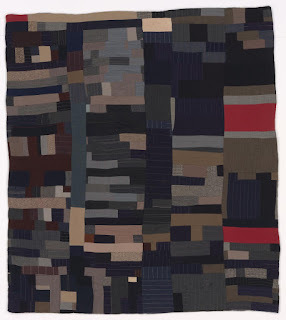 Mary Jane Hannaford didn't start quilting until she was in her 80's. 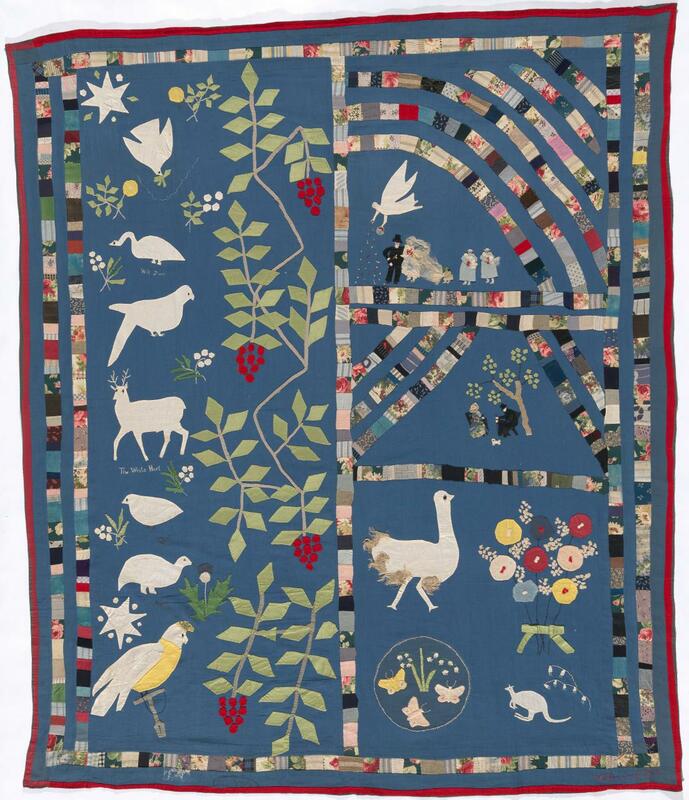 Her quilts are like no other, wonderful liberated applique shapes and figures that feel as though they tell stories. 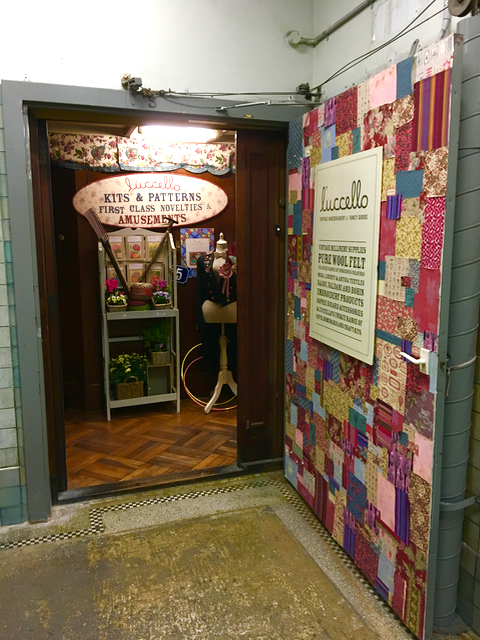 There was a wall of waggas, those wonderful Australian utilitarian quilts patched together from old blankets, flour sacks, woolen pieces and other textile leftovers. This was one of my favourite quilts. 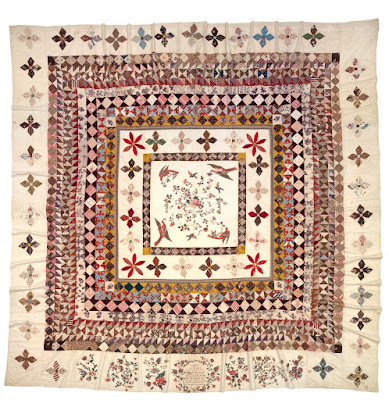 The Westbury Quilt was made by members of the Hampson family. 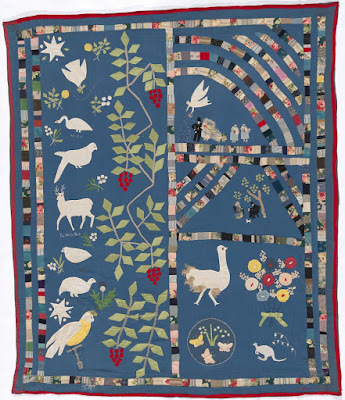 52 blocks of applique and embroidery showed scenes from farm life and inspirational sayings. so perfect in red and white. The stories of the makers and details about the quilts were fascinating. It's so much to take in in just one visit but I've been enojoying learning more by reading the catalogue written by Annette Gero and Katie Sommerville. It's a 150 page hardcover book with lots of colour photos. 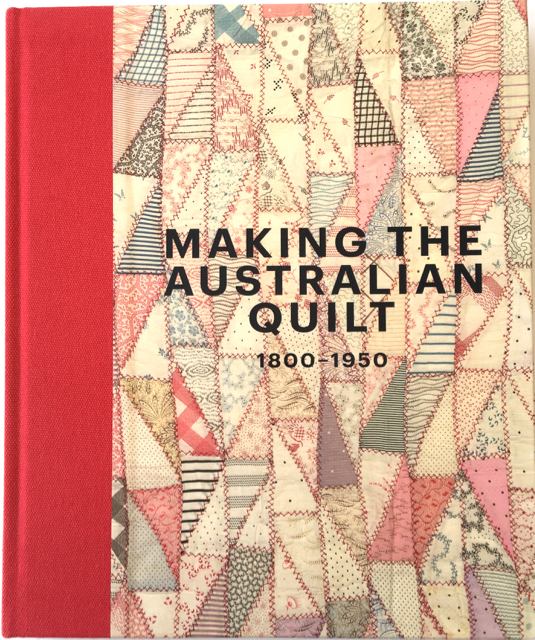 For those interested you can buy it from the NGV bookstore here. 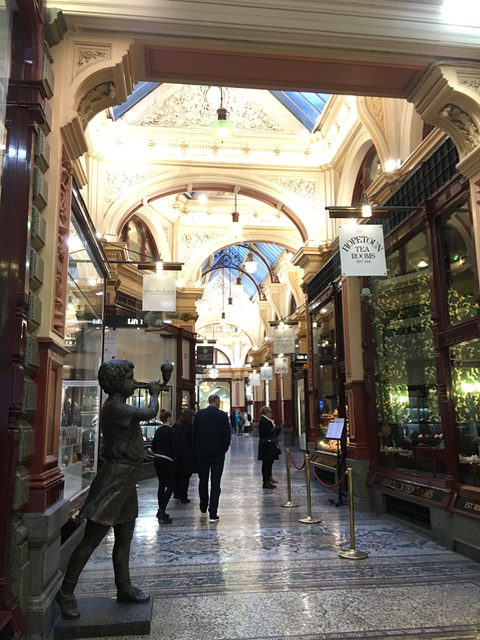 Both Mr Daisy and I used to live in Melbourne but it has been 10 years since we last visited so we enjoyed wandering around reminiscing and seeing what has changed. It is a beautiful city, easy to get around on free city center trains but mostly we just walked so we could stop and look at artistic graffiti, building architecture or displays in shop windows. We used AirBnb for the first time and found it worked smoothly. 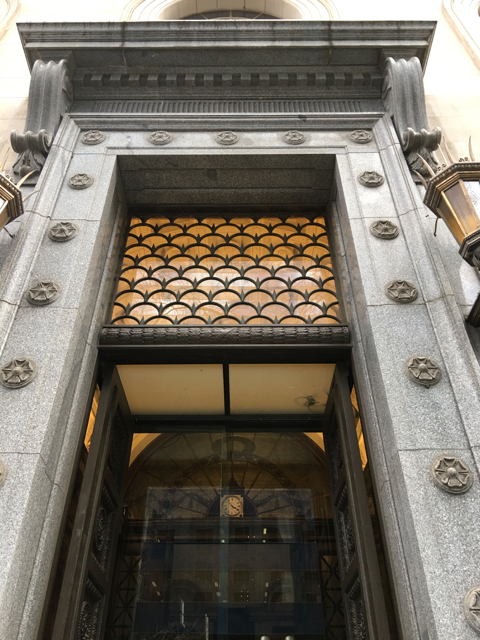 The building we stayed in was very grand with lovely details, like iron work clamshells over the entrance. 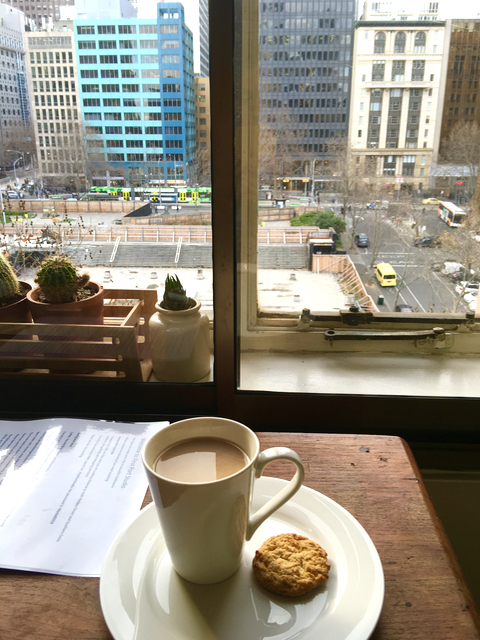 And a lovely place to have a cup of tea and watch the city buzz around. Melbourne is known for it's happening nightlife. 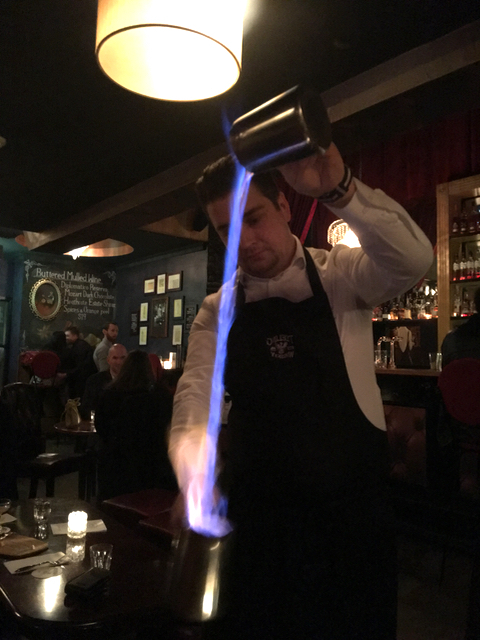 There are cocktails bars and restaurants on every corner and down every laneway. We sampled a few fabulous cocktails one of which was warmed by being set alight. The next morning we ambled through ornate arcades, admiring ceilings, mosaic floors and stylish shops. 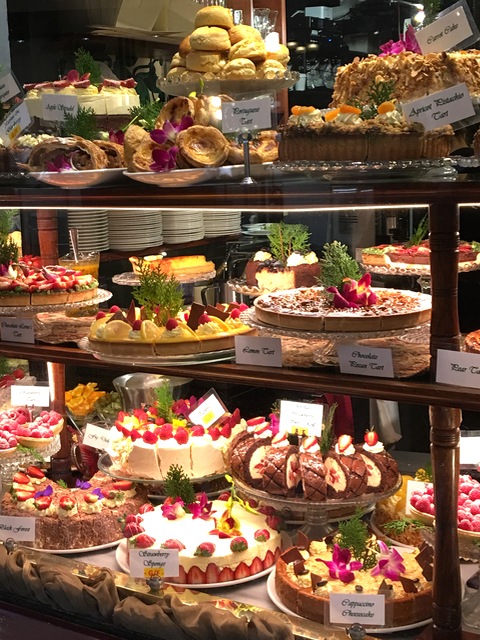 If I hadn't just had breakfast I would have been tempted to pop into The Hopetoun Tea Rooms for some cake. We saw a giant dresdan plate window glowing as the light streamed through. 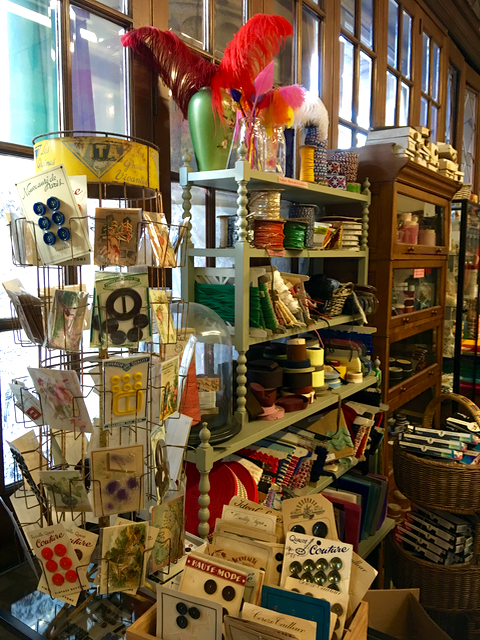 Every quilter knows that all trips should include a patchwork shop. 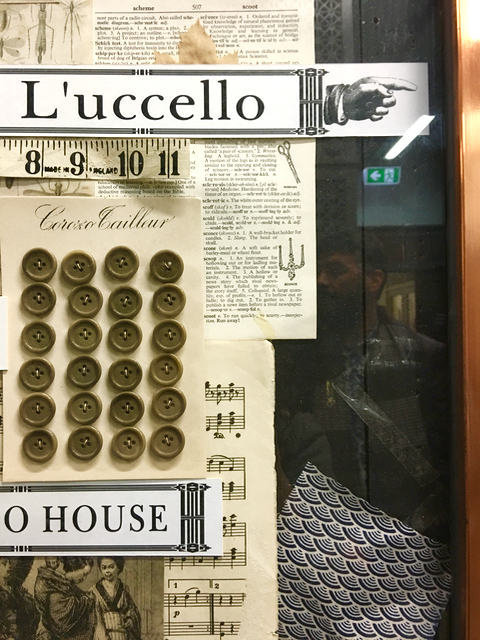 In the city center of Melbourne is L'uccello. 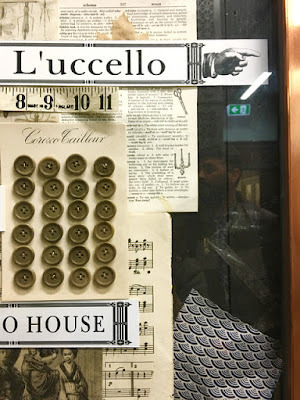 I'd heard L'ucello mentioned in revered tones before but nothing prepared me for how special it was. I felt as though I was stepping into another time. Bestill my beating heart!! 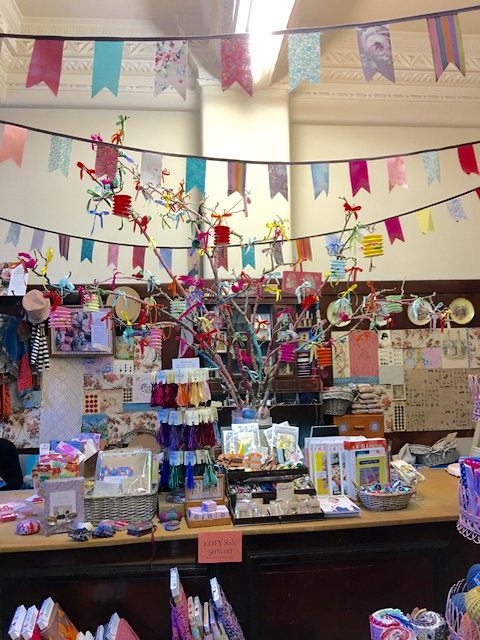 So much prettiness in one shop. 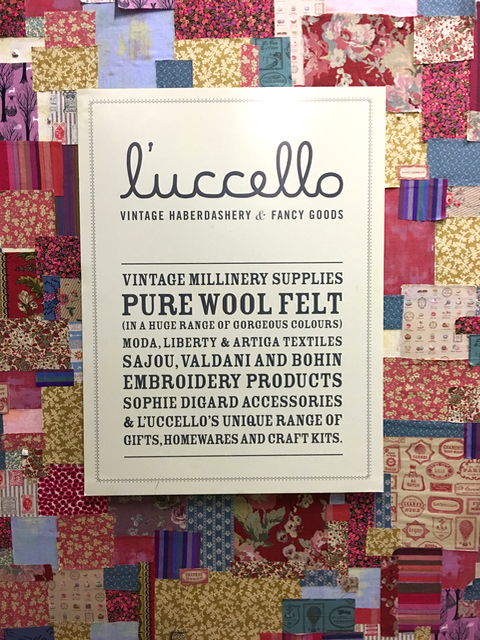 L'uccello has been described as" Alice in sewing Wonderland " and it really is. It's not a huge shop, Just one room but it is full of vintage trimmings, interesting haberdashery of all types, embroidery kits displayed on vintage counters, in pretty boxes or baskets. 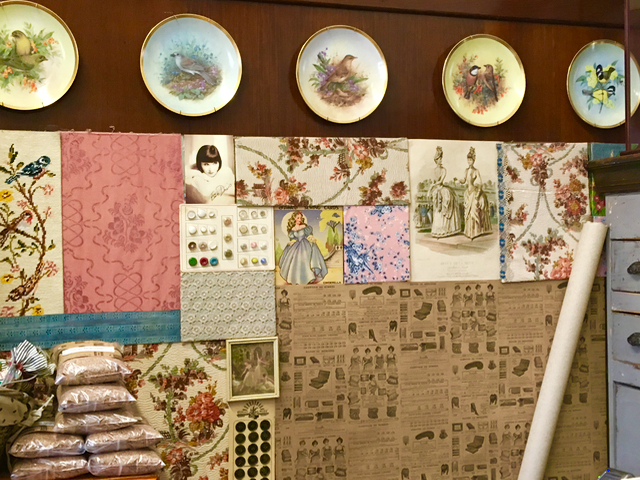 It wasn't all vintage goodies though, yes there were repro fabrics, but lots of the latest modern fabrics and classic Liberty prints too. It was all just a perfect mix. I would have loved to buy everything in the shop but seeing as I was sticking to hand luggage I restrained myself to just two things, some large scale border print and a cute little hanky. For more information about this pretty store visit their website here. 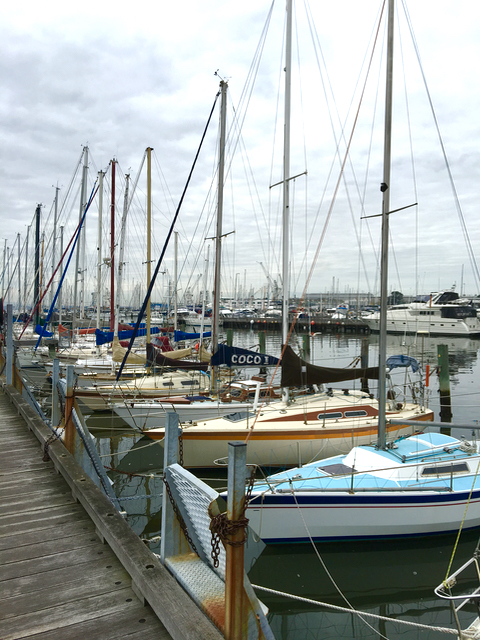 We ended our stay on the other side of the bay with a walk along the water with family. Merry times and then it was off to the airport and home again. With a suitcase full of inspiration and a happy heart of memories of a fun trip. 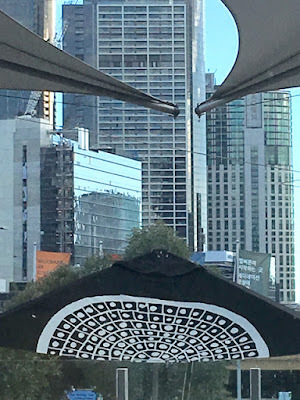 You posted the absolute best bits of Melbourne and all my favorite places! I'm glad the weather was kind to you- the wind is blowing straight off Antarctica today! I have loved reading this post, but it was a quick visit so I'm going with your suggestion of sitting down with a cup of tea and I shall take my time reading again but a little more slowly this time around. I admit I spent more time on Chapter 3 in tat wonderful shop, must visit their website. Interesting read :) I like those red flowers on the edge of the red white quilt, such a cute idea. A lovely glimps of Melbourne. I'm not sure of the correct order but you seemed to have enjoyed time together, seeing the quilts and family. Life doesn't get any better. Oh Rachael, thank you for this beatiful post ! 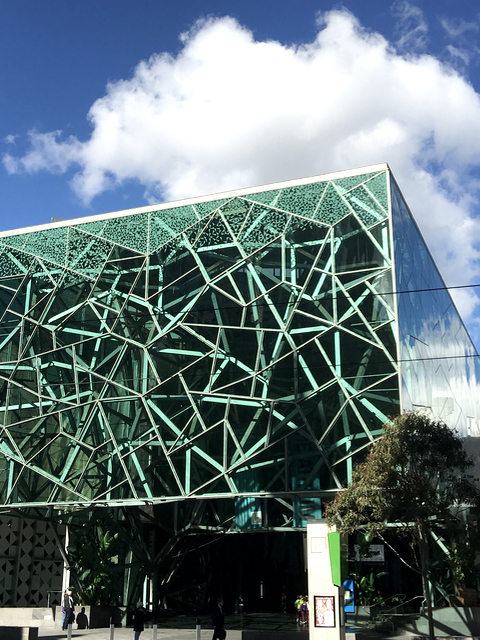 No doubt you've had a wonderful time in Melbourne! The Rajah quilt is awesome but I love the Westbury quilt too ! Thank you Rachael so very much for sharing your travels on your post. What a lovely job you did and what marvelous photos. Swoon.... and wish I was there. Was sweet to follow in your journey. Now it was your turn to make me jealous with your travels. I'd only recently heard about the exhibition, but don't know if I can wangle a visit or not. Let's just say, there is a very slight chance, but not impossible. It really sounds fabulous. 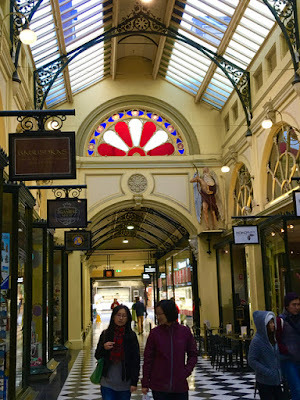 It is over 10 years since we last had a wander around Melbourne, and we don't know the city very well at all. You are making me want to visit again. Thanks for sharing. I am so pleased you had such a good time in Melbourne. I do enjoy seeing our city through the eyes of others. I enjoy exploring the arcades - just because I can! I visited the quilt display today and thoroughly enjoyed it. You do have to admire the skill of those early settlers with limited resources and poor lighting. I wonder if any of our quilts will survive that long? OMG.....you were treading the same streets as I! You are doing much the same circuits that I do when packing my purse and training it into the city for a big girls day out. I get the breathlessnessness......( ?? ?is that even a word???) when entering Lucello's, but that usually is because I took the stairs. When will I learn? Did you check out all the other delicious stores tucked away in that beautiful building? And how bad am I? I did not know the quilt exhibition was even on. I know call myself a quilter...more like a quitter. What a lovely trip and I am glad the weather did us proud. We may have a brisk breeze coming straight off the Arctic but we do have some lovely arcades to compensate. Such a lovely travel story. what a wonderful travel post. I loved seeing the sights with you. I have a dream to visit Australia one day! 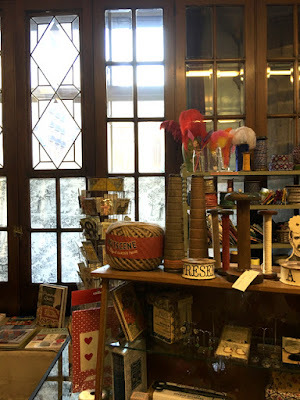 The shop looks like it is filled with treasures! The pastries in that display were so gorgeous. Thanks for a fun visit today! Ah, Miss Rachael, I'm so pleased you enjoyed your stay in our fine city. I'm hoping to get the the exhibition before long, and you visited all my favourite spots in town! What a delightful story from beginning to end. That's the kind of traveling I like to do. Even thought I might have been full from breakfast, I would not have been able to pass up a sweet treat from the patisserie or limited myself to only two wonderful items from Lucellos. You should great restraints! Glad you and Mr. Daisy had a wonderful time. I've wanted to visit Australia for a long time, so I really enjoyed your post! Beautiful quilts! 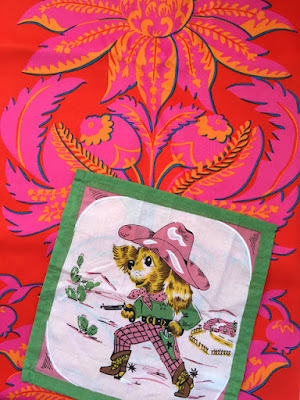 I love old quilts - so fun to look at. Fantastic quilt shop! And I love those luscious pastries! And Melbourne looks like a fascinating city. Thanks for the fun travelogue! I thoroughly enjoyed reading all about your recent trip to Melbourne. Took me back a few years to our visit, we were there one New Year's Eve and saw the fireworks display from the comfort of our hotel window - quite high up so an excellent view. Also remember walking though the shopping area with its dozens of cafes. 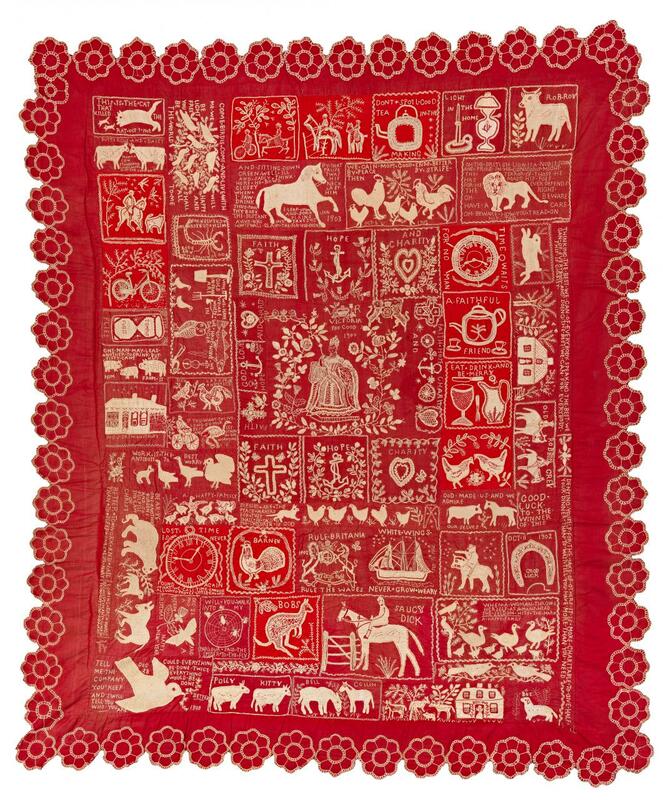 I also saw the Rajah Quilt at a quilt exhibition in London, again a few years ago. Happy memories for me and lots of happy memories for you and Mr D to store away. I keep hearing from friends about their successful uses of AirBnb. Must try it for ourselves one day. What a fabulous trip Rachael! Beautiful quilts and I thought I was a late starter lol! Wow! Thank you for taking us along to Melbourne and the beautiful, amazing quilts at the show! 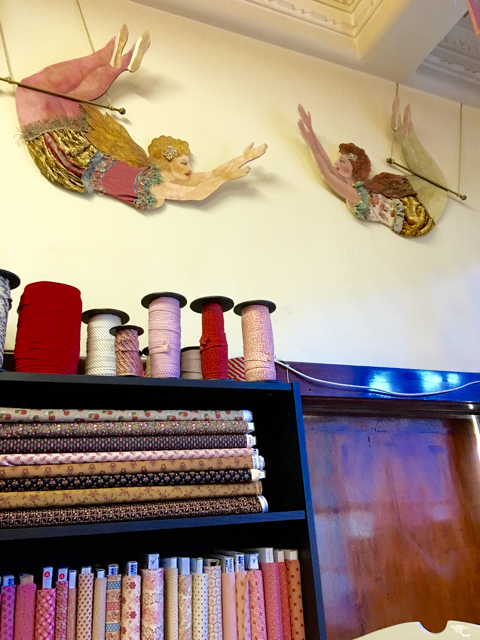 That shop does look like sewing wonderland. 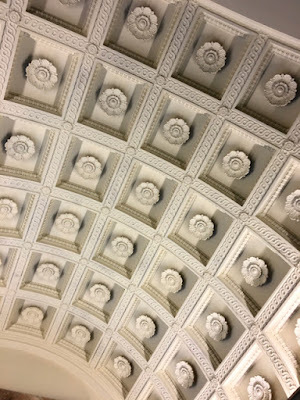 The ornate architecture is a treat as well. I checked to see if the book was available. It's already sold out and I'm not surprised. Hopefully they'll reprint it. 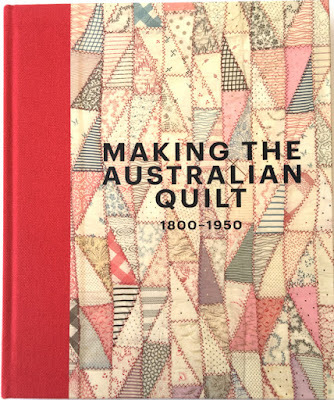 At any rate, that quilt on the cover is a huge inspiration.